Rabbi Lisa Greene is a Rabbis Without Borders Fellow. These days Lisa tells her children stories of intergenerational life cycle encounters with families she has known for years, at the same time recalling with awe her father’s similar experiences during his 50+ years as a rabbi. 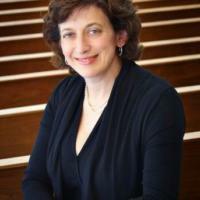 For the last 18 years, Lisa has served North Shore Congregation Israel in suburban Chicago. She is proud of creating small communities of learning and meaningful Jewish doing through partnerships with members of her community and loves teaching students of all ages through informal education especially when it brings her outside or to camp. Lisa is a student of ritual, always open to creating it anew. Before she entered the Hebrew Union College-Jewish Institute of Religion, Lisa received her undergraduate degree from the Wharton School of the University of Pennsylvania and worked on Wall Street as a securities analyst. Lessons of her finance mentors and experiences continue to impact her rabbinate meaningfully. Lisa’s three children join her in loving to travel, bake and make music, and none are shy about critiquing her sermons. Indeed as a rabbi, I see more life-threatening situations than I count, feeling them with varying degrees of space for breathing and perspective.